The former dacoit Seema Parihar, who is one of the participants of Bigg Boss 4, has been asked to appear before the district court in first week of every month. Seema Parihar approached the High Court seeking permission to participate in the show and exemption from personal appearance form October 4 to January 10, 2011.A bench comprising Justices Amar Saran and Surinder Singh rejected Parihar's petition and told her that she could move an application in this regard before the Chief Judicial Magistrate's court in Auraiya district.Do you take precautions from the heat while taking a cycle ride to the nearest market? Are the hand pumps working? What were the children doing, studying or not? Like the gestures earlier, the words came in a rush, almost spontaneously. At times, dusty mats are spread out in the courtyard, and few offer her tea. She hardly has time for these niceties but Parihar does not refuse.She listens with rapt attention before unleashing volleys of suggestions on how to get things done at the government level. "The women should unite and raise their voice against any form of oppression," she says.But, she is not tempted to shoot off the swear words she mouths in the film to correct the system which she believes needs an overhaul. As of now, Seema Parihar is standing chummy-chummy with the neighbourhood women. Seema, however, is unruffled. "I know I am no Phoolan. Nor have I any desire to become one. This is just the beginning. Abhi to bahut Ladna hai logon ke liye…purey dum ke saath," she asserts.Despite the outwardly off hand touch, Seema indeed is working carefully on her career script. The Wounded calendar is out and being distributed by a bunch of supporters apparently to compensate for the lackluster responses. "The film catalogues a woman's trials, deprivations and her angst against a society dominated by men," says a supporter. "Girls don't run away to the jungles of Chambal by choice. Situations force them," says Parihar. A terror by 20, Parihar, however, wants to bury her past including those "few instances" when she took up the gun all makes from .303 to the AK series forever.The mother of 13-year-old son Swagat, Parihar has reasons to start afresh. "I have severed all links with the past. I have a son to bring up, and a entire society to look after," she tells the electorates.This is the voice of a mother, and a politician. 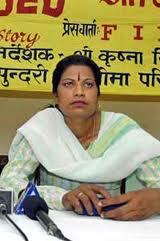 The dacoit in her seems dead.Parihar, who surrendered before Kanpur police in 2003, was facing 29 criminal cases. She has been acquitted in 15 cases.She is currently out on bail in 14 other cases. She was heading the Lalaram gang of bandits when she surrendered. Parihar took over the gang leadership after Lalaram was killed in a police encounter.